Featuring the voices of Elle Fanning, Nat Wolff, Carly Rae Jepsen, Maddie Ziegler, Terence Scammel, Tamir Kapelian, Julie Khaner, Joe Sheridan, Elena Dunkleman, Soshana Sperling, Mel Brooks, Kate McKinnon, Jamie Watson, Bronwen Mantel, Alona Leoine and Ricardo Sanchez. Screenplay by Carol Noble, Laurent Zeitoun & Eric Summer. Directed by Eric Summer and Éric Warin. Distributed by The Weinstein Company. 89 minutes. Rated PG. In kindergarten, my daughter learned an important lesson: Put up, don’t put down. In the spirit of that adage, let me start by saying that the animation in Leap! was impressive. The animators really captured the spirit, passion, and precision of movement. Years ago, we watched countless Barbie dance videos; known for lovely, classic stories with just-okay animation. It would be so great to see the Barbie series rebooted with this higher-level animation. It would also be so great if Leap! had better writing, music, and plot to match the animation. Our heroine is Felicie (voiced by Elle Fanning), who dreams of becoming a ballerina. She is accompanied by Victor (voiced by Nat Wolff), her best friend and a future inventor. Together, they steal off into the night, chased by the heartwarming Luteau (voiced by Mel Brooks). Alas, in spite of their ridiculous plan, they make it onto the train to Paris. They are quickly separated upon arrival in Paris, with a plan to meet on a bridge the next day to compare their progress towards reaching their dreams. Felicie finds her way to the ballet school, where she is kept from being arrested for trespassing by the kindly, limping cleaning lady, Odette (voiced by Carly Rae Jepson). This is where the storyline basically explodes, and not in a good way. The writers throw every plot line they can think of into this story (love triangle; spoiled rich girl made bad by her evil fame-seeking mother; Karate Kid underdog plot; overly dorky sidekick friend – to the point of being pitiful and stereotyped to the hilt). These dueling plotlines leave the movie feeling packed, rushed and sloppy. The movie’s message of perseverance and never giving up on dreams gets lost in clichéd fart-and-urine jokes, anachronisms that detract from the story and music that was out of place at best. 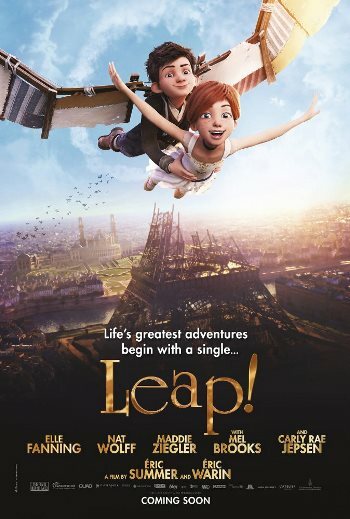 The movie is at its best when Felicie returns to the orphanage, with her spirit apparently broken, and she is able to refocus and triumphantly return to Paris. My daughter and I left the theater in dual frustration. Animated movies are at their best when they have intelligent writing, plots and character development – where both children and their parents walk out feeling they’ve been entertained. I was left with the feeling that the development team did not think highly of their audience. My daughter left saying: P.S. The Statue of Liberty was built out of copper. Copyright ©2017 PopEntertainment.com. All rights reserved. Posted: August 25, 2017. Tags: Alona Leoine, Éric Warin, Ballerina, Bonnie Paul, Bronwen Mantel, Carly Rae Jepsen, Carol Noble, Eiffel Tower, Elena Dunkleman, Elle Fanning, Eric Summer, Jamie Watson, Joe Sheridan, Julie Khaner, Kate McKinnon, Laurent Zeitoun, Leap!, Maddie Ziegler, Mel Brooks, movie review, Nat Wolff, Paris, PopEntertainment.com, Ricardo Sanchez, Soshana Sperling, Statue of Liberty, Tamir Kapelian, Terence Scammel. Bookmark the permalink.